Research Focus – Fredrick W. Baker III, Ph.D.
My research is focused on reframing systems to be more human-centered. My current areas of emphasis are using the studio model to impact learning in new arenas, and on creating effective micro-communities focused within narrow scopes. Larger goals for these concepts include creating a community-facing studio which uses human-centered instructional design to address real-world problems at the local government level, and on finding and working with my research micro-community to shape and develop the path of research in this area. 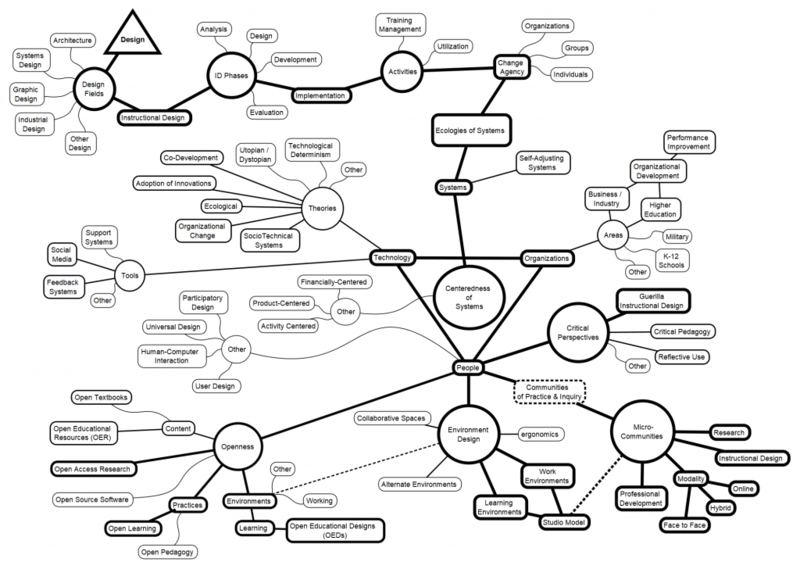 As shown in the concept map below, my research concept map is rooted in Design and travels through ecologies of systems to explore the relationship between technology-organizations- and people, with emphasis on reframing systems from the human lens.